If bigger is better, you’ll love the new and improved Sansuk Sauna and Guest House, located on Tappaya Road Soi 11 in Pattaya. In addition to the original twenty room guest house, the new eight story building (Building ‘B’) is just about complete with an additional fifty rooms. There are a large variety of rooms and suites, suitable for every taste and budget. A standard room with a Queen size bed is 750 baht. 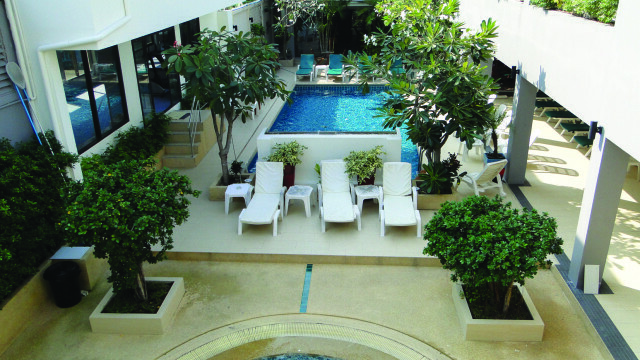 A two bedroom suite overlooking the pool, with a living room, rents for 4000 baht per night and includes breakfast and admission to the sauna. There are also connecting rooms, spacious corner rooms and rooms that are handicap accessible. All of the rooms and suites, except the standard room, include sauna admission and breakfast. Of course, the new building has an elevator to whisk you to your accommodations. Sansuk has also made improvements and renovations to the sauna complex. There’s a new hot and cold Jacuzzi and new sauna and steam rooms; there are two sauna and two steam rooms altogether. Sunbathing beside the beautiful, outdoor pool with a refreshing drink in hand is an always popular way to while away the day. It’s the ideal place for reading a book or, even better, ogling beautiful, male bodies while you relax. For fitness queens, there’s a fully equipped gym with all the latest equipment. There are six massage rooms available with well-trained masseurs to work out stress and those sore muscles. Those staying in the guest house can enjoy all the facilities during their stay. The sauna complex opens at 2 pm for those not staying at the resort. Admission to the sauna is 230 baht. Sansuk usually has around 150-200 visitors, daily, who hail from all over the world. All ages are represented, but Punya, the affable proprietor, has noticed an uptick in younger farangs lately. The two buildings are connected, allowing visitors easy access to all the pleasures the facilities have to offer. If you work up an appetite after all that swimming and cruising, you are welcome to order a meal or snack in the restaurant. It’s got a ‘come as you are’ ambiance and many of the diners are clad only in their towels or swimsuits. The extremely extensive menu includes soups, sandwiches, salads, international dishes and Thai food, all at reasonable prices. I had delicious classic lasagna (190 baht) which was layered with beef sauce and a generous amount of Mozzarella cheese. Guests who would just like to come in for a drink or a meal do not have to pay sauna admission. Punya has an extensive background in the hospitality business and it shows up in every detail of his facility. Part of what makes Sansuk Sauna and Guest House so successful is its proprietor, Punya Patana. Punya and his ‘family’ of staff members make every effort to insure that guests are pampered in every respect possible. Actually, his staff really does consist of family members, as around ten of his relatives work at Sansuk. Punya started working at the tender age of twelve, when he was a cook’s helper on a fishing boat. Within six months he was cooking the meals for the twenty-five or so fisherman. At nineteen, Punya took a two year course in tourism and catering and also studied English. Punya eventually worked at various hotels in Bangkok, including the Amari; he also worked at what is now known as the Marriott in Pattaya. Punya met his lover, Howard, in Bangkok. They eventually moved and spent ten years together in the USA. Howard, who had been a stock broker, taught Punya how to invest in the Thai stock market. 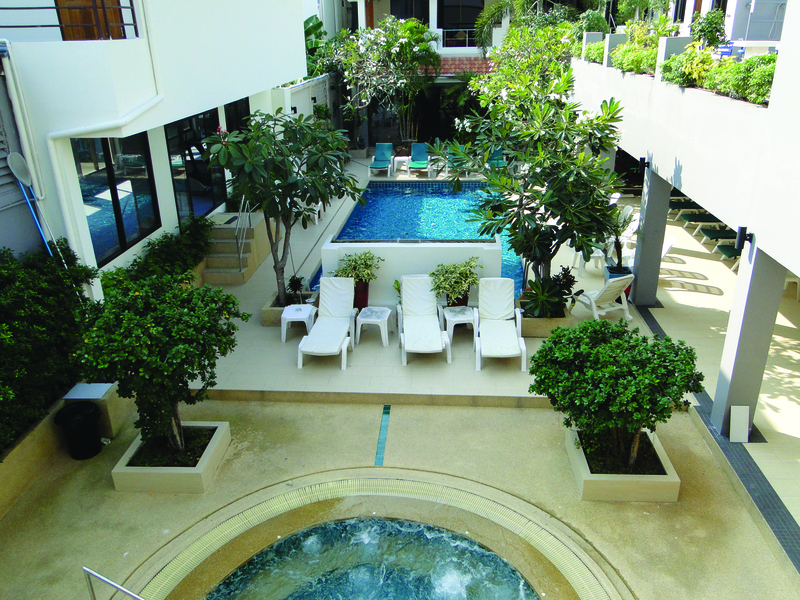 Punya was a good student and after Howard passed away, Punya invested his profits in a four story building on Soi VC in Pattaya, which became the highly successful Howard’s Guest House and Bar. Many customers would inquire where there was a gay sauna in Pattaya. As there weren’t any, Punya’s entrepreneurial instincts kicked in and the rest, as they say, is history. The sauna opened about a year later and shortly after, the guest house opened its doors. When Punya sold Howard’s six years later, he used the proceeds to do extensive renovations to the sauna and build the new eight story addition to the guest house. Whether you’re a local and want to enjoy a few hours sampling the sauna facilities: possibly take a swim, have a massage, use the fitness room, enjoy a drink and meal or have a close encounter of the sexual kind, or want to spend your Pattaya vacation at Sansuk Sauna and Guest House, you won’t be disappointed. Although it’s conveniently located about midway between downtown Pattaya and the gay beach in Jomtien, many may not find it necessary to ever leave the resort. Whatever your preference, enjoy!